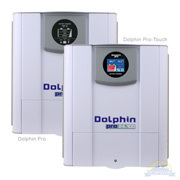 Scandvik Marine DOLPHIN BATTERY CHARGERS, Dolphin Pro and Pro-Touch Range Battery Chargers DC to DC Booster, Premium Range, Pro and Pro-Touch Range, Pro Controllers and Monitors. Whether for professional or private use, our battery chargers meet the needs of all applications, from the simplest to the most complex. Designed and developed by engineers, ergonomically structured and technically efficient, our premium and pro chargers generate power wherever it is needed in an intelligent manner. 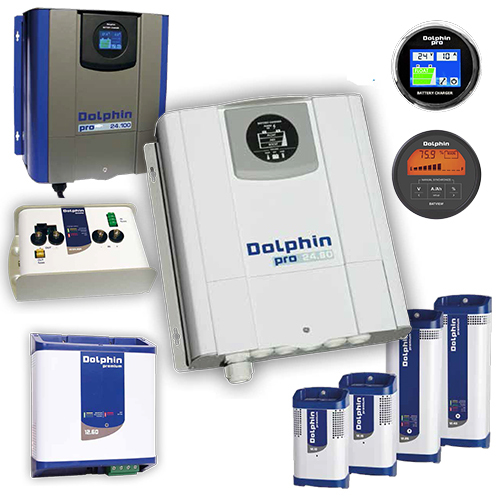 MDP is now CATS POWER DESIGN, manufacturing the Dolphin brand products. MDP Electronics has been a pioneer in the fields of control and power electronics for more than 25 years. Technologically advanced products, which are easy to use, versatile and unfailingly reliable. You can rely on Dolphin brand products! 1. 100% aluminum housing: the housing provides excellent resistance to harsh environmental conditions, especially shock and vibration. The housing also acts as a heat sink: by dissipating heat to the outside, it improves its long-term reliability. 2. Charging time is optimized by 4 charging stages which automatically adapt to the battery’s charge level. 3. All our chargers are equipped with three battery outputs with the same power. 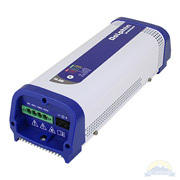 For more information regarding the the Dolphin Battery Charger Product Line, including the Owners Manual, Technical Specifications, Installation Instructions, and Warranty Information click on the resourceful links below. You may view, download and print these PDF files.